Dave Barry is a Pulitzer Prize - winning author of more than a dozen books, including Dave Barry's Money Secrets; Dave Barry's Complete Guide to Guys; Dave Barry Slept Here; Big Trouble; and Dave Barry Hits Below the Beltway. 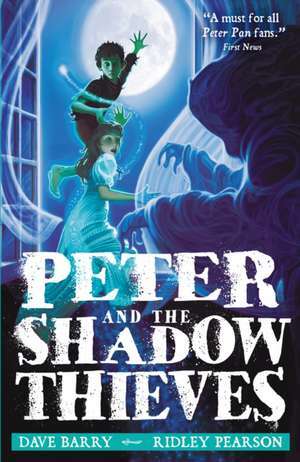 Along with Ridley Pearson, he is the co-author of Peter and the Starcatchers, Peter and the Shadow Thieves, Escape from the Carnivale, and Cave of the Dark Wind. Ridley Pearson is the best-selling author of eighteen novels, including The Kingdom Keepers;Cut and Run; The Body of David Hayes; The Diary of Ellen Rimbauer; Beyond Recognition; Parallel Lies; and No Witnesses. He was the first American to be awarded the Raymond Chandler/Fulbright Fellowship in Detective Fiction at Oxford University. Greg Call studied graphic design at the Colorado Institute of Art in Denver. After graduating in 1983, he worked as an Art Director at the Colorado Institute of Art until the desire to do more illustrative work found him in Pasadena, California, attending The Art Center College of Design. Upon graduation in 1988, he began working freelance for clients in music, entertainment, and publishing. Greg has been recognized for his work repeatedly, including awards from the Society of Illustrators and Addy awards among others.